BlackTravels.com Blog: "Slainté!" Interview with Alexandra Sutton. "Slainté!" Interview with Alexandra Sutton. 1. What Countries and Cities you visited. How long was your stay? Was this your first visit to this travel location? Do you speak the local language? 2. Was this trip for business or leisure? Did you travel in a group/solo? How did you go about planning your trip? Did you use a travel agent or the internet? I traveled as part of my master's thesis; I was intending to travel the country, interviewing various wildlife biologists who had worked on the sea eagle reintroduction. Although it was my master's research, I wasn't accompanied by anyone from my university, and although I was funded, I was completely responsible for my budgeting, planning, and everything else. I traveled alone for my entire trip, and did most of the planning online. I googled as much as I could ahead of time - climate, recent politics, culture, history, etc. to try to get a sense of what things were going to be like, but nothing I read could even hold a candle to the experience of being there. I bought my plane tickets online and flew into London because it was much cheaper. From London, I took an EasyJet flight (www.easyjet.co.uk - cost me about $50) into Glasgow Airport, and from Glasgow, I began taking buses. Scotland is so easy to get around by bus and train that it's just ridiculous. I visited almost twenty towns, bussing it all the way. You can buy tickets online (I used CityLink: www.citylink.co.uk, but there are loads of bus companies) or at any bus station, and the buses are super clean, centrally located in every town (Scots use them a lot, too) and generally on time. I also stayed in youth hostels during my entire trip, which was a brilliant idea, especially as a solo traveler. Staying at a youth hostel means you will inevitably meet people, and usually, you will instantly have someone to go out to dinner with, especially if you share rooms. This can be the singularly most comforting experience you could have when you're in a strange country and all alone. All the hostels I stayed in were spectacular experiences - I was a little worried because I'd never stayed in hostels in a foreign country before, but these were just fine. Because I bought most of my bus tickets on arrival at the station, or maybe the day before, I didn't use a travel agent. Also, if you plan to stay in hostels, it may really be better to book the trip yourself, as it can give you a bit more flexibility, and some space to change your mind (which hostels tend to be very cool about). 3. Over all, how would you rate your experience? How would you describe the treatment you received as a Black American or as an American in general? Would you visit again? Would you recommend this country to another Black traveler? I loved it! I would move back to Scotland in a heartbeat, given the chance and the citizenship. People were friendly, kind, open, and generally a joy to be around. I received great treatment, both as an American and as a Black American. As an American: The UK is a country with whom we have a long, mostly positive relationship, and with whom we also share a very similar culture. This reflects in the relationship and interactions between British citizens and Americans. I found people to be uniformly polite and interested in what I was doing, although they were open about their feelings on certain political matters. I heard enough bad Bush comments to fill a dump truck. However, the Scots in particular have a great sense of humor about matters of world import, and so I never heard anything cruel or even particularly uncharitable about myself or other Americans. As a Black American: I got so much attention. Not in an unkind way, just more curiosity or interest, particularly when I traveled into the Highlands or the small towns. People would look, or look with curiosity, or look and glance around to see if it was just me or if I was perhaps part of some student group, etc. But it was always friendly curiosity, and never maliciousness. Extending this trend, while in Scotland I did not lack for dinner partners. Men are a bit bolder in Scotland about expressing interest, and so walking into a bar, I sometimes felt like a lamb amongst wolves. On the plus side, I got a LOT of free drinks! I had shoulder-length, curly hair when I went, and people would stop me on the street to tell me how beautiful it was and ask about it, particularly young women. In general, people are very communicative--Everybody talks to everybody, no holds barred. It was sometimes fun and sometimes (like at the end of a long day) a little tiring to try to keep up with. Many people had never seen a Black American before, and were extremely keen to meet me and ask questions. They were particularly curious about where I was from - fewer Americans visit Scotland than some other nationalities (e.g. Australian, New Zealander, Polish), and even fewer Black Americans do it. So there was a lot of curiosity, and people seemed to have a genuine interest in what I was doing, especially once I told them I was a student. In general, Scots would leave the topic of race untouched until I brought it up, which I almost always did, since they generally seemed curious. Once it was on the table, I got all kinds of questions, especially about the upcoming elections and Barack Obama. "Are you going to vote for Senator Obama?" they'd ask. "Certainly." I'd reply, and without fail, they'd heave a sigh of relief. "Thank goodness. That McCain fellow seems like just another Bush to me." Hilarious. People also wanted to know about my experiences being Black in America: Were Americans really that racist? Why was the media so unkind to Blacks? What kind of house did I grow up in? What was growing up in the city like?---and so forth into the night. It was actually kind of a relief, sometimes, to be able to talk openly and frankly about race and my experiences being Black in America. A lot of Scots seemed able to relate to many of my experiences, many of them identifying as an oppressed people themselves. We compared "talking white" to "talking English" - the practice of hiding one's Scottish accent in order to appear more acceptable in business/school; we compared social issues and talked about being the victim of stereotypes (Prejudice against Scots dictates that they are uncivilized, lazy, drunk, criminal, etc. ), discussed identity crises and family structures and just generally what it was like to live in a non-majority ethnic community in a wealthy western country. It was splendid. No one ever said anything even the slightest bit off or rude to me, people were sensitive about how they phrased their questions, and UNLIKE in America, nobody ever came up to me to touch my hair unbidden. In general, I had a great time and would definitely recommend Scotland to other Blacks; it is a unique and spectacular experience. 4. What was your favorite "Must See" location or activity that you would definitely recommend to other Black travelers? Must-See City: Stirling is absolutely my favorite place in Scotland, although it has a close contender in Inverness. Stirling has so much history. Luckily, it was my first stop in Scotland, and I learned in just one day a full skeleton of the country's history and its heroes. It was invaluable knowledge to have as I traveled, and I even won a trivia game later on in my trip by happening to know what year Robert Burns was born! There's also good shopping, the city is entirely walkable if you don't want to bus, it's close to Edinburgh, Perth, and Glasgow, and the hostels are cheap and clean. Loved it! Must-See Monument: The William Wallace Memorial absolutely staggers me to this day. Just outside of Stirling (hop a CityTour Bus for £6, and you're there in fifteen minutes.) It rises up like a dagger out of a cliff, and it is enormous. Hike the steps to the top, because the view is totally worth it. You'll look out over half the county and understand the love that Wallace must have had for this place and these people. It's an indescribable moment. Must-See Natural Stuff: Loch Ness. It's HUGE! 23 miles long and holding more freshwater than all the lakes in England and Wales combined. Go there. The Hebridean Islands. Mull is my favorite and the most popular; for good hiking and crap weather, carry on to Skye. You can hop the ferry from the mainland to all these lovely destinations, and Oban (one of the main embarkation points) is a great place in and of itself to visit. Don't skip over Mallaig! Another port, smaller, but just as love-worthy. Must-See Castle: Stirling Castle. You can wander around almost the entire thing, it's partly furnished and entirely lit, and it's usually un-crowded enough that it's easy to find a quiet moment alone in a turret, looking out over the green hills of Scotland, imaging who stood in that place before you. Must-See Other Thing: The Honors (Crown Jewels) of Scotland and the Stone of Destiny. Find these at Edinburgh Castle. Beautiful, and such fascinating history. 5. What was the biggest cultural difference you experienced during your trip? Did you have any instances of "culture shock"? The biggest cultural difference was easily the food. Don't get me wrong - I love haggis, and I love deep frying stuff. I just don't love haggis every day, and I don't love deep-frying everything. So having fried toast with refried beans, french fries, pan-fried sausage and haggis, and fried eggs for breakfast....let's just say once was more than enough. However, there are plentiful Kabob shops and Thai restaurants in the bigger cities, and so it's easy enough to escape to a nice vegetarian salad every now and then. Other than that, I didn't really experience much culture shock. I have to say however – that the anti-English graffiti and the experience of radical nationalism was pretty startling at times--although completely understandable. I did notice that the behavior of young women was sometimes a little different. I'm a city girl, but sometimes the standard fare outfit for a Scots girl going out seemed a little...short...and tight...and low-cut...etc. That was a bit of a shock sometimes. And in some cities, girls will frequent only certain nightclubs. In Edinburgh, a girl friend of mine and I went out, and the first club we walked into, we almost left because there were so many men that we thought it must be Gay Night. Turns out it's just one of the bars that are popular for guys to go to and get smashed with their buddies, especially for Stag Nights (Bachelor Parties), birthdays, I-Just-Got-a-Raise, etc. The guys got pretty rowdy pretty fast and we saw immediately why the girls went elsewhere. 6. How would you describe the treatment/service you received in your hotel, area restaurants, and stores? Were there any places where you were treated especially well? Were there any areas, cities, neighborhoods in which you felt un-safe or threatened? I stayed in hostels, in which everyone was friendly and I had a great time. I befriended a lot of the staff at my hostel in Inverness, and had a great time seeing the city with them. Restaurants gave reliably good service, and even bartenders in busy nightclubs were patient with me when I couldn't understand their accents. I was treated especially well in Stirling, at every restaurant I went to. I didn't feel particularly threatened in any neighborhoods, but at one point, I was seeing a guy in Stirling who (I later discovered) dealt not a small amount of drugs. Walking home from his place near the council flats (aka projects) one morning, I did notice a few guys who gave me the shakes. Later, I came to understand that drug addiction is a growing problem in Scotland, and that junkie violence has increased dramatically. So, although I was only a little wary at the time, I became more cautious of venturing too far into the council flats later. But general caution should keep you safe. There are all kinds of rumors swirling about violence in Glasgow, and although it's been increasing, it's still generally a safe place to go. Scotland, in general, is a very safe country, and I never felt like I was in immediate danger. 7. What suggestions or advice about this country would you give to other Black travelers? What do you wish you had known about this country before your visit? Go! It's fun. Be open minded and talk to people, because they definitely will want to talk to you. And make sure to buy at least one round of drinks, because that is a fast way to make good friends while you're sitting at the bar. I wish I had known a bit more about the weather before I went! I packed jeans and lots of longsleeves and sneakers. However, it got pretty warm some days (77F) and pretty wet on others. Which meant that I alternately sweated out my shirts and soaked my sneakers in rain. A lot of the girls in Scotland wear either flip flops or really cute rubber boots (Wellingtons or Ness boots: www.nessbypost.com) with their outfits, and I ended up following suit. What a coincidence. I was in London last year (November) and took a 2-3 day trip up to Glasgow. I loved it and want to go back again. Reading this entry makes me want to explore even more of Scotland. Great write-up. :) Feel free to contact me about my experience there as well. I'm so thrilled I found this blog -- and this post! 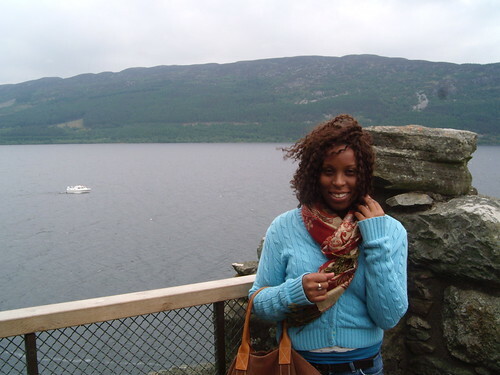 I'm an African-American woman and I'm planning a solo holiday to Scotland(with a few days in London) for this May. This gave me great insight on what to expect and has made me even more excited about my trip. I thoroughly enjoyed this well-written post. I'm thinking of going to Ireland in the fall but perhaps I should switch over to Scotland? Any thoughts? If you can find time to head to both, do it! Ryanair flights are very cheap and easy to get, so check those out. However, if forced to choose...I couldn't! See both, or see the one you're less likely to have a chance to go to again.